Shakespeare’s plays are full of bad guys, or at least plenty of men and women who exhibit bad behavior often enough to be considered bad guys. Angelo in Measure For Measure, Hamlet’s uncle Claudius, and the bastards – Much Ado’s Don John and King Lear’s Edmund – certainly qualify, as does the power-hungry Lady Macbeth. Their motives may vary but, at the core, each is able to justify his or her evil actions as reasonable. In California Shakespeare Ensemble’s latest production, director Brian Elerding has adapted the text from three of Shakespeare’s plays and crafted an episodic production starring three of his more complicated villains: Macbeth (Russ Bain), Shylock (Jeremy Radin), and Tybalt (Shahaub Roudbari). Rather than intertwining the story lines, each man’s tale remains self-contained and scenes cut back and forth between Scotland (Macbeth), Verona (Romeo and Juliet) and Venice (The Merchant of Venice), in essence making each villain the main focus of his own playlet. The shift in focus allows the audience to view the characters in a different light and perhaps draw new conclusions about the nature of evil and its ability to overtake a man’s life. All of the text is original and an ensemble of eight plays the rest of the supporting characters. Romeo and Juliet’s romance becomes the background story for Tybalt’s rage. Antonio, the merchant of Venice, takes a back seat to Shylock, the moneylender of Venice, and though Macbeth is already the star of his own play, his descent into evil becomes all the more odious when his scenes alone are lifted out of the original play. Shylock’s story works the best in this framework and is the easiest to follow. As his troubles increase so does his anger toward Antonio until his demands that the merchant’s pound of flesh be delivered backfires and causes Shylock the ultimate humiliation. 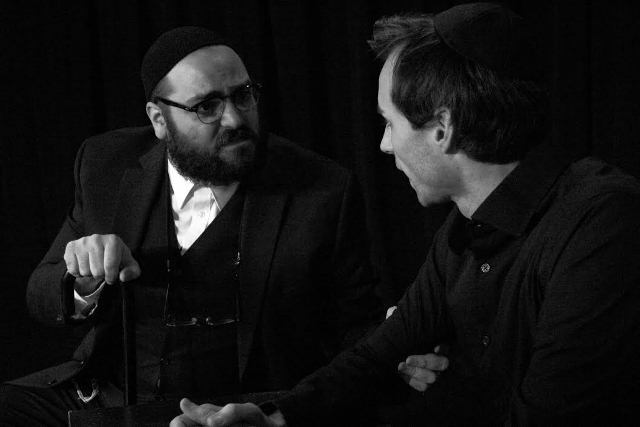 Radin builds the character effectively and creates a moving portrayal, as does Fred Cross as Antonio. Macbeth’s scenes have an abstract quality that are not as easy to track, especially when the actors’ voices drop so low that it is difficult to hear their lines. To his credit, Elerding has included a short, concise recap of each play in the program to help audience members navigate through the sometimes disjointed plots, distilled here to the main events portrayed onstage. Bain and Samantha Whittaker present a more clinical, almost passionless Macbeth and Lady Macbeth in these scenes, with speeches delivered out toward the audience. I wondered to whom the actors were speaking during these vague addresses and would have liked to have seen a stronger connection with the text and better cue pick-up with each other. It is a challenge for actors used to working in close-up for television and film to adapt to working on stage and adjusting the way they communicate to reach an audience that is present in the room rather than watching the action on a screen. Of the three villains, Tybalt has the least amount of text with which to develop his story and the most difficult job of creating an arc because the Capulet/Montague feud is already established and Tybalt is angry from beginning to end. He is an aggressive hothead, hell-bent on a fight and Roudbari, also credited with the bold fight choreography and sword work, proves to be very entertaining in his short duration on stage. 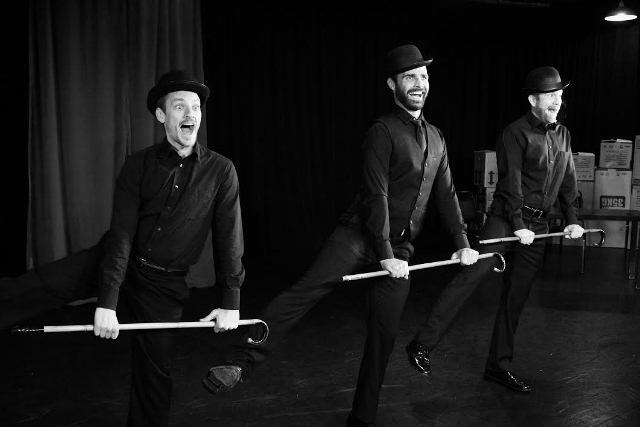 A comic introduction establishes the vaudeville structure of the show with music, hats and canes, and plenty of perky irony as “auditions” by Iago (Fred Cross), Richard III (Rob Salerno) and Aaron the Moor (Alex Weed) set the stage. Each offers one of his character’s famous speeches before they collectively morph into the darker world of the play and emerge as the masked weird sisters from Macbeth. Simple yet effective lighting helps make the transition and continues to enhance the tone throughout. The final montage offers a sobering contrast to the show’s bright opening, wrapping up the stories seriously, and in one case horrifically, with its final tableau. This is California Shakespeare Ensemble’s most polished production to date and an intriguing exploration of evil. It does not attempt to explain the villains’ actions but instead highlights them so that the audience can draw its own conclusions. Two final performances, tonight and next Sunday, are the only opportunities left to experience the madness. Go, if you can still get tickets.